A Recreation Guide to Public Lands in Northern California. It's Your Land Get Out and Enjoy It! The headwaters of the Upper Sacramento River are located at the base of Spring Hill in the Mt. Shasta City Park. You can park within about 200' of the spring. The park has had some recent restoration work in the area of the spring. The hillside has been stabilized with some large boulders and a paved area ajasent to the spring allows visitors to check out the spring without causing erosion. The headwaters spring is a popular place for people to fill drinking water jugs, I filled up a water bottle and the Shasta snow melt spring was crisp, cold and refreshing. There is a park with a playground and restrooms about 200' away. This would make for a nice place to stop for lunch when traveling I5. 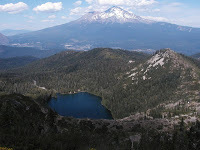 If you are going to be in this area and you are in need of some outdoor gear or to arrange a guided trip in the Shasta area, check out the newly (5/25/12) opened McCloud Outdoors & Gear Exchange. The most northern watershed part of the Sacramento is in Southern Oregon in the Goose Lake area. From there the Pit River drains the Modoc Plateau and joins the Sacramento as the eastern tributary of Shasta Lake.The Pit river actually contributes 4 times as much water (about 4,000 CSF) than the Upper Sacramento. The park is located at the northern end of the City of Mt. Shasta, take N. Mt. Shasta Blvd. to Nixon Rd and make the first Right into the park. Note there is NO swimming or wadding in the headwaters! Check out the new mobile version of this site with your smartphone or tablet PC. The mobile format displays a cleaner and faster loading version of Exploring NorCal. Occasionally some posts will not convert to mobile view perfectly, its usually the pictures that may not align as they where intended to but it's really not that big of a deal. I know the full web site can take a long time to load especially over the cell phone data networks. The mobile view should make it much faster to load while out and about or if you want to double check directions on the way to one of the destinations. I hope this change helps you find your adventure. For quick access to ExploringNorCal.com just scan this QR Code with your phones 2D barcode app. 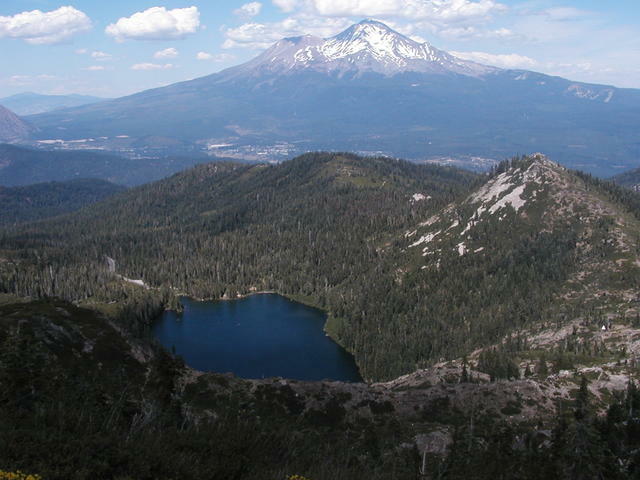 Castle Lake is located within the Shasta Trinity National Forest. It is accessible by car on a paved road. Recreation includes a primitive campground 1/4 miles downstream of the lake. Other activities include swimming, hiking, kayaking, snowshoeing, cross country skiing and ice fishing. Hiking trails begin here can take you above the Castle lake to Heart Lake and Little Castle Lake or to the Mount Bradley Ridge. The Pacific Crest Trail also runs near by and is accessible via a spur trail from Heart Lake. Unfortunately my visit was limited to visiting the lake and taking a few pictures. 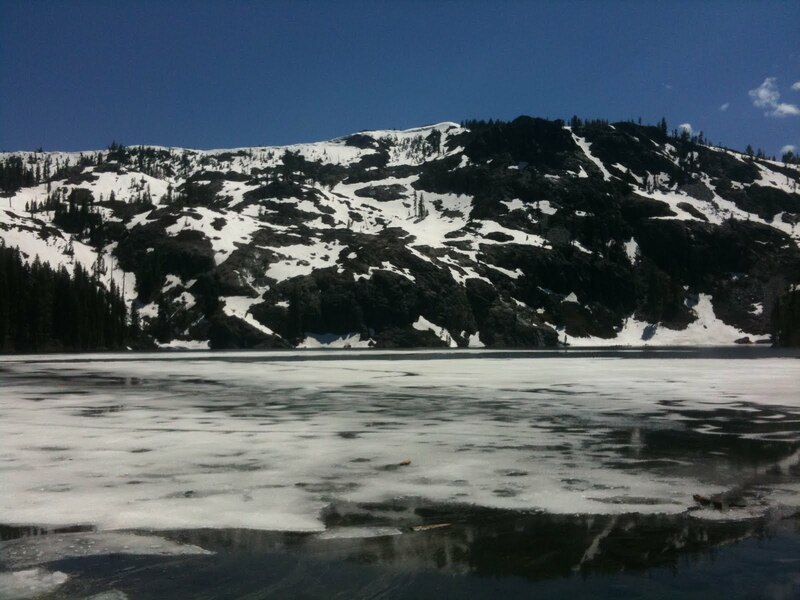 The water was crystal clear and much of the lake was still covered in 2" of ice. A long California winter has made for very late spring conditions in 2011. 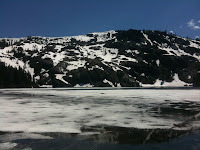 The weather at 5574' was in the 80's, some children splashed around near the shore where the water was surprisingly warm. There was still patches of 2-3' deep snow in the shadows that made for some nice snowballs. This is a great place for a number of adventures to begin and I hope to be back. Castle lake can also make for a nice quiet and beautiful rest stop if your traveling on I5, it is only about 10 miles from 5 and an easy way to check out a high country snow melt lake. If you are going to be in this area and in need of some outdoor gear or to arrange a guided trip, check out the newly (5/25/12) opened McCloud Outdoors & Gear Exchange.